Interlocking block protection systems for bridge abutments, boat ramps, channel linings, etc. CONCRIB Retaining Walls are low cost, of open web construction and can be quickly and inexpensively erected. They can be used almost anywhere a retaining wall is needed â€“ driveways, building sites, garden areas, and when planted out will add beauty and value to your property. CONCRIB walls do not require skilled labour and are easily and quickly erected. Components can be handled by two men and there are no costly foundations involved. The open web construction and use of free draining material eliminates two common causes of failure in retaining walls, namely build up of hydrostatic pressure and the destructive pressure of tree root systems. The high quality precast concrete components provide for long term durability and will not rot or warp. CONCRIB standard quality components allow for the most economical solutions for various wall heights. The design of CONCRIB walls allows speed and ease of construction for minimum cost and require little or no maintenance. wers, shrubs or creepers using the spaces in the face of the wall, to blend in with any existing or proposed environment. CONCRIB walls can be constructed to follow gentle curves, slopes, undulating terrain and can go around corners easily. Flexibility is a key word in the construction of a CONCRIB wall allowing for temporary retaining walls, due to the ability to dismantle and re-erect components as required. Where construction is required in stages, due to finance, weather or other factors, our walls are ideal as there is no permanent connection between components, allowing sections of wall to be continued when and where required. 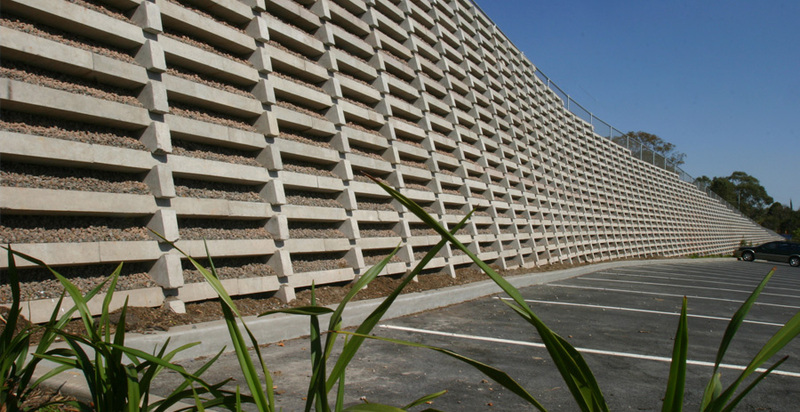 CONCRIB walls are designed as gravity retaining walls using a system of four header sizes for various wall heights. Combinations of header sizes can be used for different wall heights and walls even up to 20m in height can be catered for. The performance of the CONCRIB system and components have been fully evaluated and tested by the Queensland University of Technology and a full report is available on request. Units are manufactured using grey concrete only but can be spray sealed any colour you require. abutments, boat ramps, channel linings, etc. 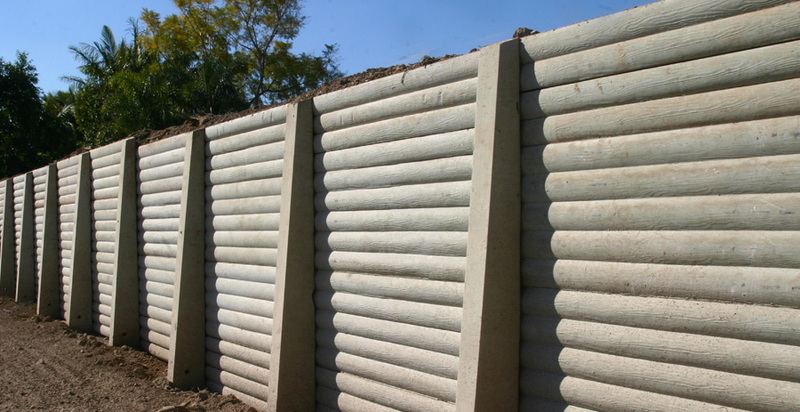 Concrib Offers a Choice Maximising Land Values Concrib concrete sleeper retaining walls have mostly been constructed using our reinforced concrete piers,with the sleeper beams place behind the piers to complete the system. This offers an attractive economical wall system. In some circumstances it is desirable to have the front face of the retaining wall to be coincident with a property boundary. To address this possibility Concrib can offer our system utilizing hot-dipped galvanized columns in place of the concrete piers. This treatment gives a flush finish as well as the ability to extend the columns above the top of the wall, thereby enabling acoustic fencing to be incorporated if required.